DOT is one step closer to flipping Fifth. The Fifth Avenue protected bike lane got a thumbs up from the Manhattan Community Board 5 transportation committee last night, according to Transportation Alternatives Manhattan Organizer Chelsea Yamada, who live-tweeted the meeting. The plan to install a bikeway for 15 blocks of Fifth between 23rd Street and Eighth Street was also endorsed by the CB 2 transportation committee earlier this month. The current buffered bike lane on Fifth Avenue is often rendered unusable by double-parked drivers. It is one of the most heavily-biked streets in the city, and TransAlt’s petition to “Flip Fifth” and install a protected lane now has more than 17,000 signatures. Back in December 2013, the CB 5 committee passed a resolution supporting a redesign of Fifth Avenue for better walking, biking, and transit through Midtown. Last night, someone asked why the bikeway won’t extend beyond 23rd Street, and DOT said it would be too complicated, according to Yamada. Also last night, DOT introduced a plan for a permanent “shared street” on Broadway between 25th and 24th streets, by Madison Square. We’ll have more on that later. Given that the 3′ buffer is now on the sidewalk side of the parked cars, would it be feasible to put those flexible plastic bollards there? Might help mitigate the risk of dooring cyclists. Good news but sad to hear the truth slip out: it’s “too complicated” to put bike lanes where they’re needed most. shared space looks awesome based on twitter pics. Too complicated for 2017, but at some point soon’ish they will continue it north of MSP (and protect 6th ave up to CP and close car traffic on 6th ave between 57-59). I’m hoping BDB will be in legacy mode in second term and do some cool stuff – maybe the beginnings of the B’way green line? This is great. DOT needs to do this anywhere and everywhere there’s a buffered bicycle lane on the wrong side of parked cars. I see very little of this sort of problem on existing streets with similar treatments. (8th Ave & 9th Ave, e.g.) It’s also nice to keep the buffered area clear if you should need to use it as a passing area, to pass a slower cyclist. https://uploads.disquscdn.com/images/2871ab2ff14ce91adcbee2b7e1fbb325ba3107ef0d6dbef1dfee8edb25c9086c.png All I wanna see is the concrete curb they have here, everywhere in the city where there is a buffer. The CB 5 committee had previously tabled a vote on the project after a packed meeting where some property owners complained about the redesign. Now the full board is slated to vote on it April 12. 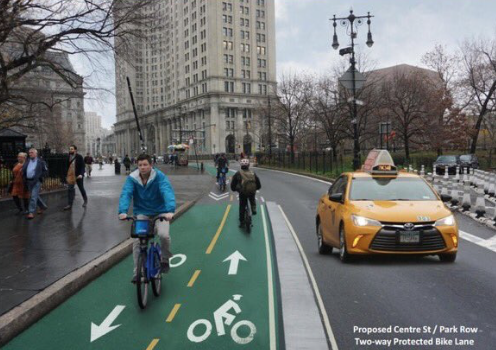 Will the Sixth Avenue Protected Bike Lane Get Done in 2016? The plans affect streets in four Manhattan community boards, posing distinct challenges for DOT's typical practice of securing endorsements for street safety projects. Soon cyclists won't have to weave between double-parked cars and speeding traffic on the heavily-traveled stretch of Fifth Avenue south of 23rd Street. Last night DOT presented a plan to flip the biking and parking lanes between 23rd Street and 8th Street to Manhattan Community Board 2.